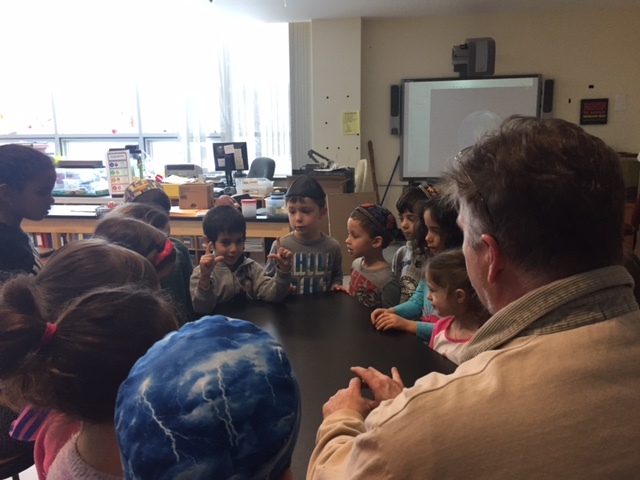 Lower Division Science Specialist Steve Lechner kicked off the week with a lesson in Super Bowl Science. Steve set up five different stations: Reaction Time, Field Goal, Momentum, Rolling Football and Google Earth, where students investigated various aspects of football. Students started with testing Reaction Time. To test this, one student held a strip of paper in his or her hand, while another student tried to catch the paper as the first student dropped it. Next was the Field Goal station, where students were able to measure the angle at which it is easiest to kick a field goal-close to the goal, far away, or somewhere in between. At the Momentum station, a metal ball was rolled down a ramp with a wooden block at the end. The students used different ramp angles to measure which one moved the wooden block farther. Students in the higher grades did some math, determining how many third graders it would take to equal the weight of the heaviest Patriots player along with other football-related math questions. At the Football Rolling station, students measured which way a football rolled farther, laying flat or on its end. Finally, students used Google Earth to find Gillette Stadium. Starting with the whole earth, they zoomed right into the stadium, as if they were standing in the middle of the stadium.